Dr. Winskill and his dental dream team are ready to take care of your dental health. Dr. Winskill graduated from University Of Washington in 1983. He has 2 boys, Christopher who has been on life support since he was 3 months old and is now 29 and Matthew who is 20. Dr. Winskill and his wife Jan have been very involved in the community and have started a charity called TOYS For KIDS of Intensive Care Families. They provide Christmas toys for ill children and their siblings. Please see the TOYS FOR KIDS page of the website for more information. 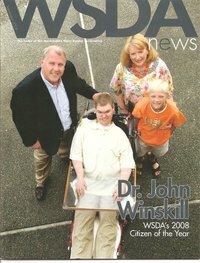 Dr. Winskill received the Washington State Dental Associations CITIZEN OF THE YEAR 2008 for his work with TFK and providing dentistry for those in need in our community. He also received the PLU Alumni Community Service award 2008 for his service as well. Dr. Winskill and his team are committed to providing quality dental care with personalized attention to your total dental health as well as helping those in our community in need.